Ameles is a group of small, ground-inhabiting mantids. They can jump very good and run very fast. The females have reduced wings which covers about 1/4 of the abdomen. The wings of the males are longer than the abdomen. 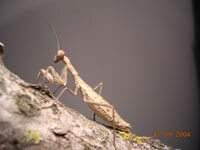 The colors of this mantids are various (grey, brown or green). Ameles is living at the ground and up to 30cm above (e.g. small bushes). Their habitats are dry meadows and dry soils with less vegetation. Ameles is very aggressive, so they can not be kept together. Also young nymphs (L3) should be seperated. At present, at least 23 species are described, e.g. Ameles decolor (CHARPENTIER, 1825), A. heldreichi (BRUNNER VON WATTENWYL, 1882) and A. spallanzania (ROSSI, 1792). Ameles are very interesting mantids, but not easy to keep or to breed. So beginners shouldn't keep mantids of this genus. Hatched nymphs are very small, so they need special food like springtails. Ameles from Europe need a diapause in winter. But only the ooths are left in winter, so they should be kept in a refrigerator.